Welcome to a conducted tour on Frauenchiemsee with Monika Huber. 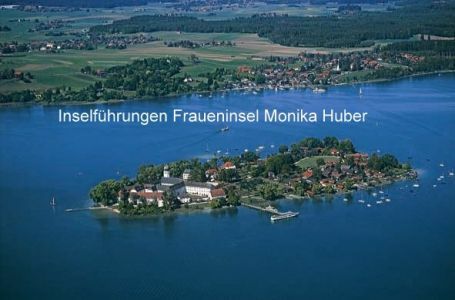 The history of Frauenchiemsee is closely connected with the history of its abbey, founded by Duke Tassilo 3rd of Bavaria ( 746 - 788 ). From this period still present is the "Torhalle" with its chappels and the famous angel-frescoes, one of the oldest historical monuments conserved in Bavaria. At the end of the Carolingian time the abbey flourished and Charlemagnes grandson, Louis “The German” ( ca 804 - 876 ) appointed his daughter Irmengard as abbess of the nunnery on Frauenwörth. Additional to the visit of the church and the “Torhalle” we`ll have a walk around the village with its pitoresque houses and flowergardens, often depicted in 19th century, when a painters`colony flourished on the island. Therefore at the cemetery graves of many eminent people may be found. The tour takes about an hour and can be joined to wedding- or birthday- ceremonies as well as seminars, sightseeing tours etc.